Motorists are putting lives at risk - including their own - as the craze for taking ‘selfies’ takes to the road, a survey reveals today. Up to one in nine (11 per cent) admit snapping themselves at the wheel while driving despite warnings on the danger of using mobile phones. It says that ‘selfie’ fans aged between 18 and 24 are the ‘worst culprits’. Some 11 per cent confess to doing so compared to one in 14 (7 percent) on average across all age ranges. They are also more than twice as likely to connect to social media sites at the wheel. Up to one in nine drivers admit snapping themselves at the wheel while driving despite warnings on the danger of using mobile phones. It also found that Twitter, Pinterest and Instagram are also much more widely used by 18 to 24-year-old drivers. But the ‘selfie’ driving practice was condemned as recklessly risky and selfish by leading road safety charities Brake and IAM. The self-portrait snaps have become so popular with that ‘selfie’ was named as the 2013 word of the year by Oxford Dictionaries. Brake spokeswoman Laura Woods said: ‘This is a case of selfie selfishness. ‘Using a phone in any way at the wheel dramatically increases the risk of crashing and killing or seriously injuring someone. But the 'selfie' driving practice was condemned as recklessly risky and selfish by leading road safety charities Brake and IAM. A ‘selfie’ showing A-list stars including Meryl Streep, Julia Roberts, Kevin Spacey and Brad Pitt became the most retweeted photo ever earlier this month after being shared by Oscars host Ellen DeGeneres. Confused.com said hashtags including #drivingselfie and #drivingselfies 'are prompting social media users to take photos of themselves and post them online when behind the wheel'. In America, an NBC investigation found more than three million pictures filed under hashtags including #drivingselfie, #drivingtowork and #ihopeidontcrash. Previous UK research suggests that a third of drivers use hand-held mobile phones at the wheel despite an increase in fines from £60 to £100 in August last year. One in eight culprits log onto social networks and a fifth use apps. Half check text messages whilst driving and a third scan emails. Brake said penalties should be tougher and the IAM called for a police clampdown. Neil Greig, IAM’s director of policy and research said: 'This seems to be another form of peer pressure to take part in the latest trend. ‘The best way to avoid it is to give young people the skills to stand up for themselves and not follow the herd and post silly photographs online. 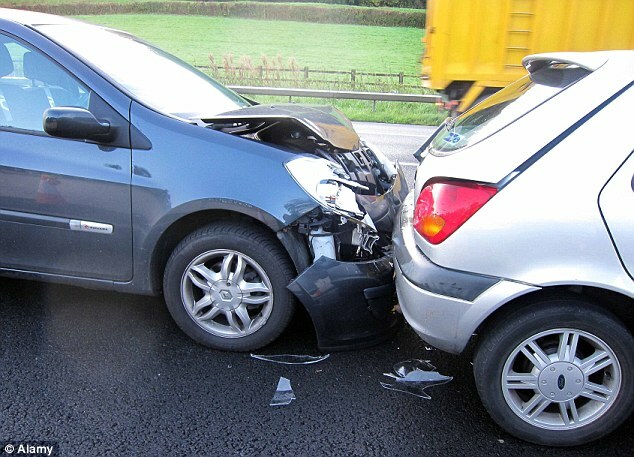 Confused.com head of car insurance Gemma Stanbury said it was the duty of drivers to behave responsibly: ‘Taking your eye off the road, just for a second, to read an alert or take a photo can have potentially fatal results,’ she said. ‘We’re aware that social media and photo sharing sites do not actively encourage users to take photos or post updates when driving, so the responsibility sits with the individual not to do so when behind the wheel,’ she said.